Does Sushi Help You Lose Weight? You don't have to give up sushi if you're trying to lose weight. Depending on the type of sushi you choose, it may even help increase weight loss slightly when eaten as part of a reduced-calorie diet. 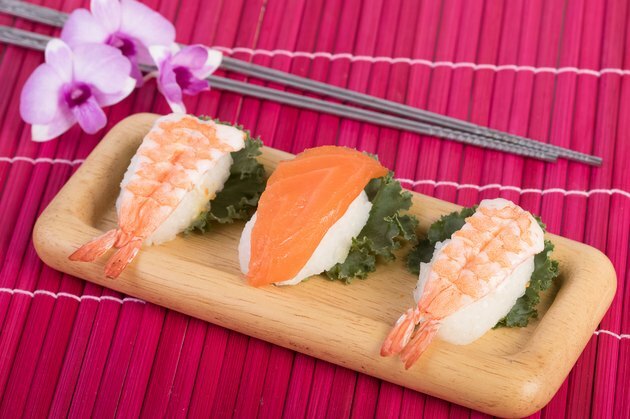 Three of the main components of sushi -- fish, rice and vinegar -- all have potential weight-loss benefits, as do some of the traditional accompaniments to sushi, although the research is still preliminary regarding their effects on weight. You'll still want to enjoy it in moderation, however, and some people should avoid sushi altogether, as there are some potential risks associated with consuming raw fish. A study published in Behavioral and Brain Sciences in 2004 noted that eating sushi may help bring about a modest amount of weight loss, but these results are preliminary and need to be verified through additional, larger studies. Whether or not sushi is beneficial for weight loss depends at least in part on how much and what type of sushi you choose to eat. The calories in sushi can vary significantly from about 200 or 300 calories for a meal to over 1,000, with many of the calories typically coming from the rice used to make the sushi rolls. To lose a pound of body weight, you need to create a 3,500-calorie deficit by eating less and exercising more. Choosing the lower-calorie varieties of sushi may help you cut calories and slightly increase your weight-loss results. Fish is generally a good food for weight loss because it provides protein without a lot of fat or calories. A study published in the International Journal of Obesity in 2007 found that men who included fish as part of a reduced-calorie diet lost about 2 pounds more in four weeks than those who didn't eat any fish. The American Heart Association recommends eating fish or seafood about twice a week and choosing those varieties lowest in mercury, which include salmon, shrimp, catfish, clams, flounder, scallops, crab and pollock. Avoid shark, tilefish, swordfish and king mackerel, the types of fish highest in mercury. A study published in The FASEB Journal in 2008 found that rice consumption is associated with having a lower body weight, less body fat and a smaller waist circumference than not consuming rice. Further research is necessary to verify these effects, however, as this study was sponsored by the USA Rice Federation. You're likely to get more weight-loss benefits if you choose a type of sushi made with brown rice. A study published in the International Journal of Preventative Medicine in 2014 found that consuming brown rice led to greater decreases in weight than consuming white rice. Consuming a beverage containing about 1 tablespoon of vinegar daily for 12 weeks helped to lower the body mass index, abdominal fat and waist circumference of people who participated in a study published in Bioscience, Biotechnology, and Biochemistry in 2009. Although the exact amount can vary based on the chef, a sushi roll typically contains about 1 cup of sushi rice. Each cup of sushi rice usually contains about 3 tablespoons of an equal mix of sugar and vinegar, so each roll of sushi should contain a little more than the vinegar used in this study. Wasabi, that spicy green paste that typically comes along with sushi, may increase its weight-loss benefits. Although the research is still very preliminary, an animal study published in Nutrition Research and Practice in 2013 found that wasabi may help limit weight and fat gains in those fed a high-fat diet. Further research is necessary to verify that wasabi has the same effect in people, however, and to determine how much you'd need to eat to get these benefits. When you have sushi at an Asian restaurant, you may want to add green tea to your order. This type of tea may help with weight loss by increasing metabolism and fat burning slightly, according to a study published in Physiology & Behavior in 2008. Another study, published in the Journal of the American College of Nutrition in 2010, found similar results and noted that green tea may also be beneficial for lowering your cholesterol. The increase in weight loss varied between an extra 5 to 10 pounds over the course of eight weeks, depending on the study. Because weight loss is a matter of cutting calories, it makes sense to choose the types of sushi lowest in calories when trying to lose weight. Nigiri, which is just raw fish placed on a small ball of sushi rice, is the simplest form of sushi and usually the lowest in calories. Maki, which are the sushi rolls, contain other ingredients besides the rice and fish, and are thus typically a bit higher in calories. Avoid any sushi that contains cream cheese, mayo or fried fillings, such as rolls that are labelled "spicy" or "crunchy." These toppings are what put some types of sushi into the high-calorie category. Instead, choose those that only contain fish, rice and vegetables. Other ways to decrease the calories in your sushi include asking for your sushi to be made with less rice or choosing a naruto version of sushi rolls, which means your roll will have cucumber holding it together instead of rice. While sushi may help you lose a little extra weight, it isn't safe for everyone. Fish and seafood tend to contain varying amounts of mercury, and raw fish may also be contaminated with food-borne illnesses, such as Vibrio vulnificus and salmonella. Fish that has been frozen can more safely be eaten raw than fish that has never been frozen, as the cold temperatures kill some of the harmful organisms. The only way to truly kill all of these food-borne pathogens is to cook the fish. Raw fish isn't advised for pregnant women, children or people with compromised immune function. Academy of Nutrition and Dietetics: Is Raw Seafood Safe to Eat?